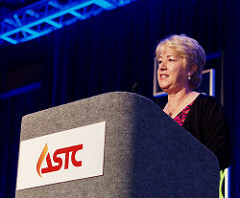 ASTC Chair Linda Conlon, chief executive of the International Centre for Life in Newcastle upon Tyne, England, United Kingdom, electrified the audience during the opening session of the 2016 ASTC Annual Conference on Saturday morning, September 24, at the Tampa Convention Center. Her warning of the importance of science centers engaging with migrants and refugees sparked enthusiastic response on social media and stoked multiple conversations throughout the conference. Below are her remarks and a sampling of the resultant conversations. A new word entered the vocabulary this year when the U.K. voted to leave the European Union: “Brexit.” Only weeks after the historic decision, we still don’t know what Brexit truly means, but it seems to have unleashed something which is reverberating not only around the U.K. and Europe but also the entire world. Zakaria pointed out that those who voted for Brexit were “disproportionately older, white, working class, less educated, and poorer” while those who voted to stay in the European Union were, in the main, “younger, ethnically diverse, better educated, and better off.” I guess this sounds familiar to Americans in the audience, because as Zakaria pointed out, this mirrors the divide playing out in the current Presidential election. He went on to say, “This divide is rooted in the central reality of our times—a world being reshaped by the advance of globalization and technology.” But he argued that although economics was undoubtedly important, the “most disruptive element of all has turned out not to be the fast and free movement of goods, services, and information across the planet, but of people. The migration of people in and out of countries has produced an emotional backlash against immigration, refugees, and indeed the entire idea of globalization.” As Zakaria put it so starkly, “Economic issues affect the head; identity issues hit the heart.” Even before the Brexit vote, many of us were aware of the current refugee crisis in Europe, which has provoked a palette of reactions in public opinion, ranging from unconditional solidarity to pure xenophobia. More than 65 million people in the world today have been displaced by conflict and persecution. Immigration is causing large societal changes that play out in specific, tangible ways in our communities. How do we integrate so many new people? How do we deal with different languages, beliefs, customs, and religions? At the Ecsite [the European network of science centers and museums] conference last June, Bojan Markicevic, a refugee of the war in Sarajevo, had the sharpest words and bleakest assessment on the relevance of science centers. Next to his life and death stories of separated families, starvation, and deprivation, science centers seemed of limited use to migrants and refugees. Of course, science centers are not a substitute for addressing immediate needs, like food, clothing, shelter, and health care. But we do have a duty to engage with new members of our communities, wherever in the world they might be—and we are starting to do so. Instead, the museum provided German lessons linked to an understanding of the country’s technological culture and way of life. It also catered for young refugees with low educational backgrounds, offering workshops run by their own retired craftsmen who volunteered to share mechanical and technical knowledge. Here in the United States, the Explora science center in Albuquerque, New Mexico, has held an ongoing series of conversations with a wide range of communities, including Mexican, Vietnamese, and Chinese immigrant groups. Explora staff asked participants to describe the kind of community they want, their aspirations, and the obstacles standing in the way. Recently, their visitors have said, “I like that there are people like me here” and “I tell my friends that they shouldn’t be intimidated to come here.” When prompted to explain, “What does ‘like me’ mean?” Explora says there are many answers—it’s about how people look: clothes, tattoos, piercings, skin, or hair color. Often, it’s about staff being warm and welcoming. Sometimes it’s not exactly clear. A visiting first grader said, “I think I don’t know what I think. But I think I wanna come back here again.” So, Explora is certainly doing something right! And, of course, there are many more examples of innovative approaches. From the Immigration Museum in São Paulo, working with some of the estimated one million overseas immigrants in the state, to the award-winning social programs at Science Alive! in New Zealand, for families displaced by the Christchurch earthquakes. Every country on every continent is affected in some way by migration and the movement of people. And, as chair of ASTC, I am very proud of what our global community is doing. In six weeks’ time, ASTC joins with UNESCO, the United Nations Educational, Scientific, and Cultural Organization; with ICOM, the International Council of Museums; and with science center networks in other continents of the world—in Europe, Asia, the Middle East, Africa, India, and South America—to celebrate the first International Science Center and Science Museum Day. This really is a big deal for us. It’s a fantastic opportunity to showcase some of the great things we are doing and to highlight that collectively we can address global challenges such as the ones I have highlighted this morning. International Science Center and Science Museum Day is on November 10—I’m sure you have the date in your diary and are planning great things, but, if you haven’t, there’s still time. And you’ll be able to find out lots more about it during the conference. Many of us have been comfortable talking about the role of migration in a historical context when we cover early human evolution. But I think we need to recognize that this is also a contemporary story, a permanent characteristic of humans to which we can adapt and respond but not ignore or deny. Major shifts in demographics and therefore increasingly diverse audiences are going to impact more and more on science centers. If you’re thinking that this is something that can be shelved for a few years while you deal with greater imperatives, or that the answer lies in creating a few special programs for minority groups—think again. This is NOT an optional box-ticking exercise. There will come a point, sooner for some of us than others, when the current core audience becomes the minority. When that tipping point inevitably occurs—we need to be ready. This requires a step change in our thinking—and a fundamental re-examination of business models. What is fit for purpose today will not be fit for purpose tomorrow. I hope that we can explore this together at the conference, share experiences, learn from each other about what can work—and, just as importantly, what doesn’t work. It’s time to wake up and smell the coffee—wherever the beans come from. Science has the power to be a unifying force. Let’s not miss this opportunity to make a difference.